I have to say that the one thing I have come to expect of US chocolate is excessive sugar. I’m not sure why there is so much sugar in US artisanal chocolate but here it is again, with a flat, lifeless chocolate, smothered with sugar and some coffee thrown in for good measure. The coffee comes strongly through as the chocolate starts to warm in your mouth. I assume the grittiness if coffee but as the chocolate melts it floods your mouth with a very sweet flavour which when combined with the coffee drowns out all but the vanilla. If we rate this against other US chocolate, it is quite good. It has a sweetness, yes, but for most people this dark chocolate is going to be more edible as a result. The sweetness helps balance off the slightly bitter but surprisingly delightful coffee. 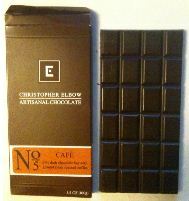 In fact, if Christopher Elbow cut back on the sugar this bar would be a contender against many European bars. Again the soy lecithin and vanilla add, I feel, an odd flavour and distinct aftertaste but I also think if you’re chewing your way through a bar with friends with a cup of coffee or a latte while chatting and enjoying good company you won’t notice it. I applaud Christopher Elbow for trying to bring a higher quality chocolate to the US but I think a higher quality base chocolate and less sugar would add extreme quality to this chocolate.